 As we are all aware, the internet is a breeding ground for jokes, puns, skits and other forms of humor centered on XENA: WARRIOR PRINCESS. However, the Xenaverse mailing list has also given rise to a special form of wit known as Gabberish. Over the past few months, Gabrielle and her occupation as bard have been the basis for puns and word play among an enthusiastic group of fans. Kate Maynard (aka Perfessor Puppet), the instigator of this madness, pulled together these postings into an official Lexicon, which presents the history of Clan MacGab, an off-the-wall creation of internet psyches in collision. Kate's original post sparked a landslide of responses, which have been organized into the terminology section of the Lexicon. The appendix includes some of the messages themselves, which shows how the thread developed. On Xenaverse, Gabrielle has been a focus for any number of discussions ranging from the light-hearted Gabberish to serious analytical discourse on the importance of her character as an heroic archetype. Our thanks to Renee O'Connor for doing such a great job with a wonderful character. This is a classic case of less is more, or at least more than you will ever want to know. Clan MacGab is an erudite if somewhat eccentric collective of ROCkers, ROCettes, Gabfans, Gabatics and Gabriellites who inhabit that anomalous cyberphenomenom known as XENAVERSE. Lacking a secret handshake, or even shame, members of Clan MacGab devised to create their own internet dialect, called Gabberish. MacGabbers around the world as we know it have dedicated themselves to the exploration/exaltation of Bardish cultcha lost to the ages, as well as Gabbish influences on contemporary society. This first installment of THE OFFICIAL GUIDE TO CLAN MacGAB and the GABBERISH LEXICON is dedicated to Renee O'Connor, Goddess Emeritus of Clan MacGab, and who, in our eyes, can do no wrong...unless she happens to have an aversion to puppets. Robin, aka Jeezil Pete, Jr.
With special thanks to Spikus and Penth, Co-Warlords of Xenaverse, and to Steven Sears, who will vouch for our insanity. "With all due respect to the recent discussions of - dare I say it? - XENITE terminology, I must admit that this unrepentant Gabfan felt somewhat insulated from the heat of those (now extinguished) flamewars. However, and to my horror, I have suddenly become aware of some type of residual paranoia that has polluted the Puppet's Playground Institute for Creative Gab Studies. "Now every time I use a phrase from the Official Gabberish Lexicon, Collegiate Edition (abridged), I start looking for hidden microphones, flies on the wall, carefully disguised video surveillance cameras (I just murdered my toaster, having convinced myself it was looking at me rather strangely) and corporate lawyers who look remarkably like Scottish terriers. "The question is: can a puppet be sued for infringement of copyright? If Carmen types the words Gabfan, Gabbing plaster, Gabberwocky, Gabriellite, Bardbarella, et al, should she be held responsible for any potential lawsuits, or is she just reporting some hearsay plucked from the sock drawer? 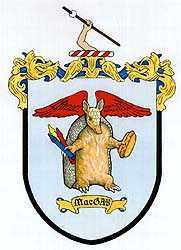 "Well, in order to circumvent any legal hassles that might pop up in the future, I've taken the liberty of writing the Lord High Constable of Scotland, seeking official recognition for the Clan MacGab Society. "From my standpoint, there would be plenty of advantages, not the least of which is that any party daring to sue the clan would have to be sequestered for the duration of the trial and fed nothing but Scottish food until a verdict was reached. (Holy Haggis Hurl!) Clan members would be honor bound to wear lots of funny clothes sans underwear and gather once a year at Grandfather Mountain for the traditional Hellene- Caledonian Gabgames, where we would drink lots of single malt whisky and throw telephone poles just for fun. (I have my own telephone pole with the name "Talmadeus" written on it; but then, sometimes a cigar is just a cigar). Best of all, though, is the chance to practice the Gabberish dialect without fear of lawsuits, if not ridicule. suggestions for the colors of the Clan MacGab tartan. episode in which the Gab is uncharacteristically riled. "GABBING PLASTER: The official art material of Gabdom. that comes with a side order of nachos and a margarita. "*Next Week's lesson: Gabberish sports terminology. "Perfessor Puppet --- 'I have many *useless* skills!'"